Cottage cheese is making a comeback! This high-protein powerhouse is low in calories and makes a filling snack any time of day. 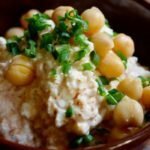 In this recipe, it’s anything but basic, paired with creamy chickpeas and the exotic flavors of chaat masala and smoky chili powder. If you can’t find chaat masala, use curry powder. Cottage cheese is low in calories and makes a filling snack any time of day. Place cottage cheese into two medium serving bowls. Sprinkle evenly with chili powder and chat masala powder; mix well. Top evenly with chickpeas and chives. Tip: Chat masala powder is an Indian spice blend with dry mango powder, cumin powder, and several other ingredients—available at any Indian grocery store. Enjoy as part of breakfast. Add veggies for a great lunch. If you have questions about the portions, please click here to post a question in our forums so our experts can help. Please include a link to the recipe in your post.